Home.myflightapp.com is the PUP that uses misleading techniques to prevent removal. Use Reimage to locate malicious components and get rid of them faster than with uninstall instructions. A full system scan blocks virus reappearance and prevents traffic to malicious domains. Home.myflightapp.com is yet another search engine developed and promoted by Polarity Technologies Ltd. This software developer is well-known for the production of potentially unwanted programs (PUPs), such as browser hijackers. My Flight App virus is one of them. My Flight App mimics the legitimate search app and presents itself as a useful tool for travelers as it allows booking flights, tracking their status, comparing flight prices, checking arrivals and departures, and so on. 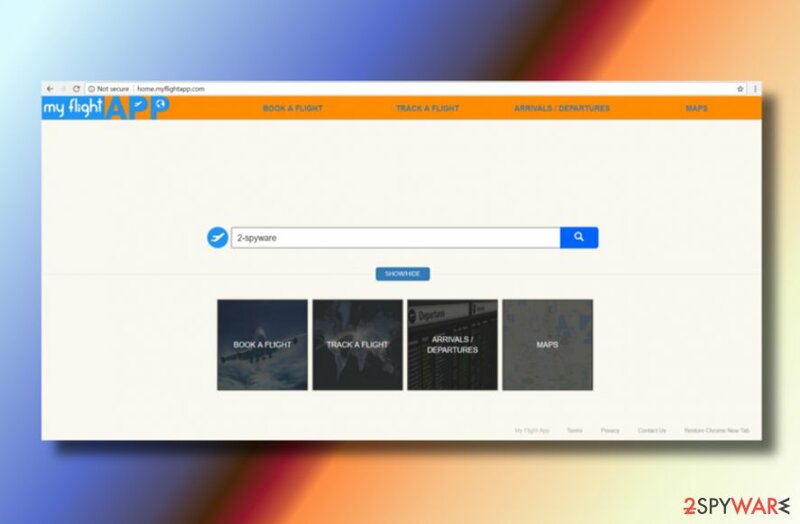 However, once it is installed on the system, it drops a related extension on the browser and corrupts its settings by changing the start page, search engine, and new tab URL address to Home.myflightapp.com. All these changes are made without user's knowledge. Fortunately, My Flight App virus can hardly be described as a serious computer infection as it does not harm the PC directly. However, its real aim is to increase traffic to shady websites and help them improve their position in Google search. Although this search site displays Yahoo-based search results, none of the links it provides should be trusted. 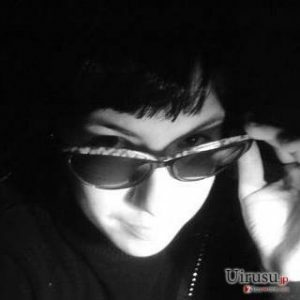 The app works as an advertising platform as it displays bogus search results filled with links to the shady third-party websites. Redirects that it causes can lead you to phishing websites which promote fake updates, products, and services. According to security experts, you should not keep this hijacker on the system but remove My Flight App virus without wasting your time. Previous practices with browser hijackers have revealed another shocking fact – browser hijackers can also be involved in the distribution of promoting potentially dangerous ads. The longer people delay the My Flight App removal, the more eye-catching pop-up ads they may receive. Such ads can contain such slogans: “Loose weight in two weeks,” “Click here to win a prize,” etc. Be careful and avoid clicking on them as they can disguise viruses and other malware. We may collect personally-identifiable information through the use of our Services upon your contacting us so that we may respond to your questions or comments, such as your name, email or mailing address, or other information you include when contacting us. Also, it may track people's browsing activity, URLs, bookmarks saved, and similar information that may be sold to third-party companies that get the revenue from shady operations. As a consequence, you may start receiving spam or daily calls from tech support scammers. As you can see, this browser hijacker can cause more problems than help. Therefore, you should remove Home.myflightapp.com virus without delay. For this purpose, we recommend you to try Reimage. Potentially unwanted programs are seldom downloaded purposely. In most of the cases, even if they do have official websites, the download button is not active which is a clear signal that something is not right. The method that the PUP developers use to spread their programs technically is known as bundling. This term explains an act when free programs are combined with attachments that are usually named as free add-ons, extensions, toolbars, and similar. Third-party download sources are full of bundled software, which is why it's important not to speed up their installation and check the Advanced/Custom installation setup. Potentially unwanted attachments should be revealed during the installation procedure and marked by default, so all you have to do is to remove a tick from the checkbox. In addition to bundling, you can come across browser hijacker or adware installer while visiting an untrustworthy third-party website or clicking on suspicious ads. Make sure you avoid them as well. It's not sufficient to reset web browser to remove Home.myflightapp.com virus. A potentially unwanted program does not consist of a single file. PUPs, such as adware and browser hijackers, is a whole package of files that may be installed in various system's places, which is why it's advisable to use a professional anti-malware utility. A deep scan with an antivirus will also check if My Flight App hijacker was the only component that accesses your PC by bundling. Here, look for Home.myflightapp.com or any other recently installed suspicious programs. 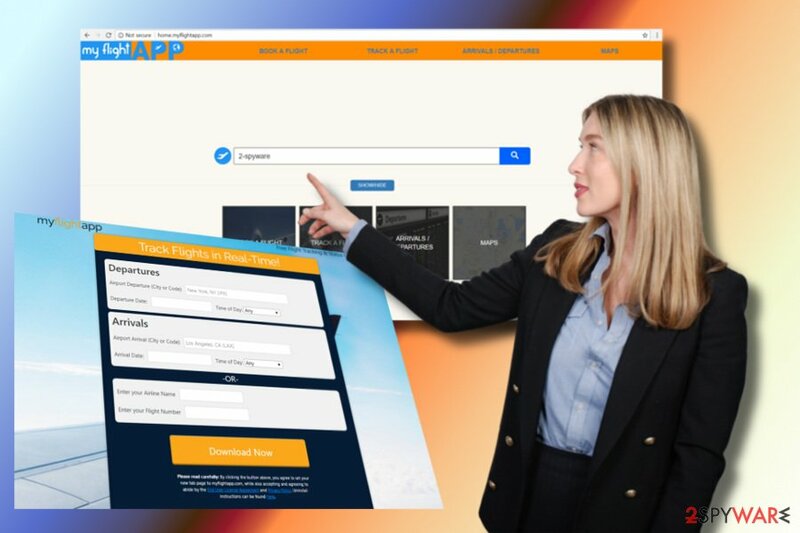 Wait until you see Applications folder and look for Home.myflightapp.com or any other suspicious programs on it. Now right click on every of such entries and select Move to Trash. When in the new window, check Delete personal settings and select Reset again to complete Home.myflightapp.com removal. Once these steps are finished, Home.myflightapp.com should be removed from your Microsoft Edge browser. Here, select Home.myflightapp.com and other questionable plugins. Click Remove to delete these entries. Now you will see Reset Firefox to its default state message with Reset Firefox button. Click this button for several times and complete Home.myflightapp.com removal. Here, select Home.myflightapp.com and other malicious plugins and select trash icon to delete these entries. Click Reset to confirm this action and complete Home.myflightapp.com removal. Here, select Extensions and look for Home.myflightapp.com or other suspicious entries. Click on the Uninstall button to get rid each of them. Here, look at the Homepage field. If it was altered by Home.myflightapp.com, remove unwanted link and enter the one that you want to use for your searches. Remember to include the "http://" before typing in the address of the page. Now you will see a detailed dialog window filled with reset options. All of those options are usually checked, but you can specify which of them you want to reset. Click the Reset button to complete Home.myflightapp.com removal process. ^ Gabriel E. Hall. How to remove a browser hijacker. 2-Spyware. The highest-quality information about malware and general security. ^ Andy O'Donnell. How to Test a Suspicious Link Without Clicking it. Lifewire. Practical advice to help you live better with technology. ^ Michael Sweeney, Karolina Lubowicka. What Is PII, non-PII, and Personal Data?. Piwik PRO. A blog about insights with data segmentation, data activation, user-centric reporting, and painless tag implementation while ensuring complete data security. This entry was posted on 2018-02-02 at 08:12 and is filed under Stealing programs, Viruses. You can quickly scan the QR code with your mobile device and have Home.myflightapp.com manual removal instructions right in your pocket. How did you remove Home.myflightapp.com?